My guilty pleasure? Lilly Pulitzer. I’ve loved the fanciful designs, bright colors and classic cuts ever since I was a little one. But y’all… as much as I want it to be, it’s just not really a thing here in Texas. Don’t hear me wrong! You still see plenty of shifts at Sunday services, and the planners are definitely a commonality here, but I’m talking head to toe, top to bottom, all the way Lilly. 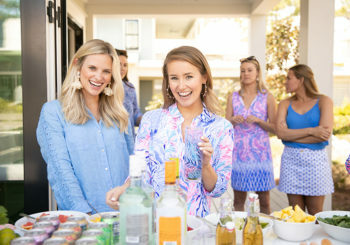 So when I visited the Lilly Pulitzer store in Charlotte this summer, that’s exactly what I wanted to experience – head to toe Lilly! And I found exactly what I was looking for. Let’s break it down. While both the top and bottom are both Lilly, they work in all sorts of ways. I can pair this Elsa top (that I’m loving in this fall print as well) with everything. Jeans and boots, white shorts and sandals, talk about versatile! I especially love how it brings out the pattern in this timeless skirt. A short, tailored skirt paired with a flowy shirt is a perfect, flirty ensemble for breaking in early fall! The verdict? I’m in love with it all, and Texas has been depriving me. P.S. Had to let you in on the amazinggg J . C R E W sale – 25% off with code SHOPFORFALL. The perfect chance to go snag my new favorite perfect-with-riding-boots jeans! J . C R E W F A C T O R Y isn’t looking too shabby either, with prices slashed up to 50% off and this new puffer vest to rule them all. You look gorgeous girly! I need that skirt in my closet! well look at youuuuu! Love this look! Glad the Charlotte gals treated you well! Love the Charlotte Lilly store! This is just darling! Can’t wait to see the other look you put together. such a cute look, and i think jeff nailed the poses!! 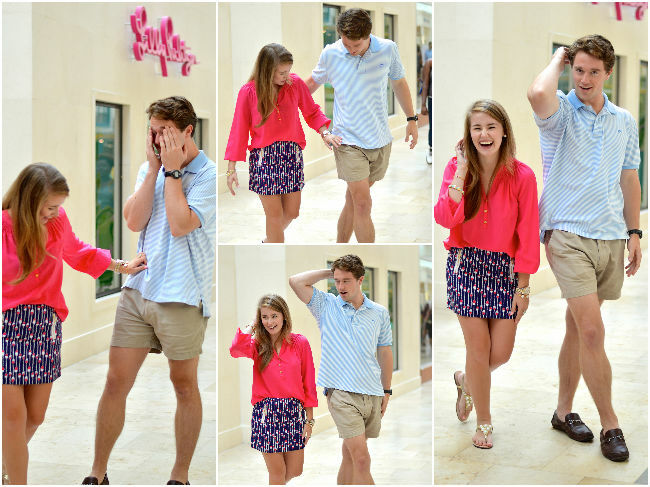 Oh my goodness, those photos of you and your boyfriend are adorable!! looking beautiful as always dear! i think i’m in love with that skirt! Absolutely love that skirt, the outfit is stunning on you!